Create your own MDF wood word in classic style Olde English font. 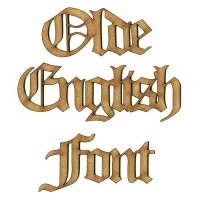 Create your own word, name or phrase in Olde English font - ideal for vintage, antique and historical projects. Custom words make your projects extra special - personalise a keepsake, gift or plaque with a name - add a place you've visited to a scrapbook page or journal... endless possibilities!